There are 3118 posts in this topic. You are on page 9 of 63. I'm still hoping they use that Super Skill shot animation for Kitty...and the Dazzler extra-ball. The number of instance for a message is displayed in the Edit box. I'm also guessing since all imported images are Raster-12 maybe they can not have these transparencies??? Could you please export your 0xD0C image and import it again without any other modification ? this way, it is simply converted from Compressed-1 to Raster-12. If it does not work, we'll know it's because of compression. Otherwise, it could be the color of the surrounding pixels that have changed (it could be your image modification, but also the way I convert them in case you don't use a 4-bit palette). So I went ahead and exported all of the images from this mode and re-imported them without changing anything. That was easier than just doing 1 and hoping it would finally be selected as the picture in the mode. So the image looks the same in Pinball Browser before anything is done and after it is re-imported, but you can see they have all changed from Compression-1 or Compression-7 to Raster-12. Then I updated my game with the code. When any of the pictures come up in Xavier mode...they all now display a square box instead of the pictures outline as it should. After you do hit their required target and their picture is revealed....their picture is displayed in a square box. In the regular code they are displayed as just floating there. I'm guessing the game is using a transparency around these heads. When they are exported the transparency is lost (or just not exported). As I said before, I did try to import a "head" image into Pinball Browser that did have a transparency around it, but as soon as it was imported into Pinball Browser it displayed the transparency as black around it. The plus side of that was, even though it displayed as a box before she was discovered....when the picture was revealed...it was at least floating instead of still being in a box. EDIT: In hindsight I realize this head is also in a box...you just can see it in game because the box is black along with the other surrounding area on the DMD at that time. I know there are other times that transparencies are used in the X-Men code (and I'm guessing others). For example....during Beast mode I have found 3 DMD image types that are layered one on top of the other when being displayed in the game. It seems that a lot of instances of WHITE being displayed on the images in Pinball Browser is actually a transparency in the game and not white at all. Below I have posted examples of the 3 images that would be stacked on top of each other during the game. Can you not just remove the entire background of the image (hence creating an image with a transparent background) before re-importing? If i remove the background of an image that is supposed to have a transparency, will the game display unwanted items in the background of my imported images? Still yet to find this out, but thought i would chime in on this transparency thing. On one of my above images (the one titled transparency) I did remove all of the background and made it a transparency all around her head. When I imported it into Pinball Browser it changed the floating head to having black around her head instead of the transparency. So I'm guessing the imported image losses the transparency when importing it. I will try to post the original PNG that I imported, but I'm not sure if pinside will reformat it. It's also going to be really small. UPDATE: It posted fine. If you open this image with a viewing / art program that supports transparencies you will see it is just a floating head with no borders. That update worked wonders for what I was looking to modify. I went back in and changed one occurrence of WOLVERINE to SHADOWCAT and all of the other Wolverines remained Wolverine. I loaded the code and noticed that Wolverine was back to being called Wolverine in the regular game. Then I finally got Shadowcat to come up in Xavier mode and she was listed as Shadowcat. This is a pretty neat software package Well done. I changed the game over music in my BDK to play the Aggressive Expansion Track from the Dark Knight soundtrack. Very, very cool. I also changed the name LAU in the game to COW Just so the game could have a cow in it lol. FWIW FG does not seem to load all the audio. There do not seem to be hardly any voice quotes in the sound files. This may be because the game has three levels of sound...family, moderate, and adult but I could be wrong. 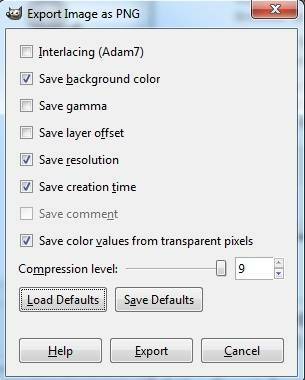 oga posted what colors to use, perhaps the colors are somehow getting changed during re-save. It appears they have to adhere to the specific palette he mentioned earlier in this thread; some image editing programs may make changes to the image color palette when the image is re-saved. oga83, it looks like the cannon firing images would be a good place on AC/DC to check out the things I am experiencing. Not too many frames to swap and an easy animation to see in the game. 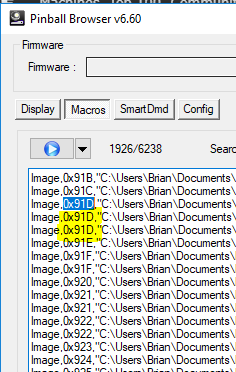 If you were to export and re-import 0x1229 - 0x1239 images. I believe the cannon animation on the game would just appear all white on the left side of the DMD....when normally it would show the background images of 0x123A - 0x1268. I think what is seen as white on these frames in Pinball Browser are actually transparencies (or where they should be). It seems the transparency info is getting lost in the export and also lost when an image is imported (and converted to black during import). I will do a little tinkering with the Beast image I posted above to see if it is really losing the transparency when importing (in which case I should NOT be able to see the background behind him) or Pinball Browser is just displaying transparencies that are imported as black. So I had 2 Beast images that cycle back and forth. In the game it has a background wall (which I posted above) and a foreground set of beakers (which is posted above). I exported both of the Beast frames that cycle. One of them I just re-imported and the other I made a transparency around him. The one I just re-imported displayed the same as it always did in Pinball Browser (with white around it), but it was, of course, converted to a Raster-12 image. The image with the transparency around it showed black in all of the transparency areas when viewed in Pinball Browser. I flashed these to the game and tested it out. They both displayed just as I thought they would...the first image (that was just re-imported) showed as white all around him and you could not see through the white to see the wall image that should be showing behind him. The second image that had the transparency drawn around him, displayed black all around him...and again you couldn't see through the black to see the background wall. I think I've done all I am smart enough to do as far as this is concerned. I think this is tied to the images having transparencies, but I'm not good with art programs or understanding their options. I did have an option box pop up when I went to save my image after I made the transparity around it, but I didn't understand them so I just left them default. I'm guessing the game is using a transparency around these heads. When they are exported the transparency is lost (or just not exported). Thank you for all these tests. It will help. I think you are correct : it's definetely a question of transparency. I had a review of my code, and it seems that I am making a mistake with the white color. I am applying a 4-bit mask (to remove bits I didn't understand :- and that's why transparent pixels are displayed in white. I will investigate deeper on this. Thanks for creating this. I had no problems updating the sounds in 24. I've hated some of the canned music and sounds on my 24 so this fixed all of that. You can even swap out Chole for someone else on the series. And the Sean Gallery music can be put in there to make it more realistic then some of the whiny music they used. Added the real CTU ringtone, so many changes that can help. Haven't done any graphics but the sound part works great. Just look for stuff on youtube and convert to an .mp3 and you've got tons of possibilities. 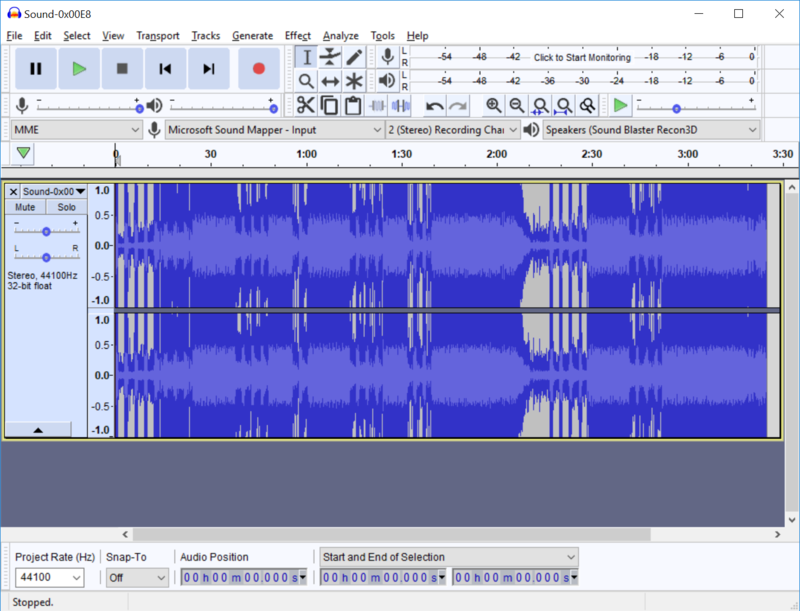 I used Audacity so remember to use 'amplify' to boost the volume to match what stern did and 24000hz before you save and import. Now all we need is a tool to finish the WOF code! I think I have another bug to report. I was just getting around to toying with the Macros feature a bit. I got a stock X-Men LE 2.4 update and imported a picture, imported a different sound clip and changed a Message. Everything played and displayed fine in Pinball Browser. I saved the Marco. I close down the program and restart it. 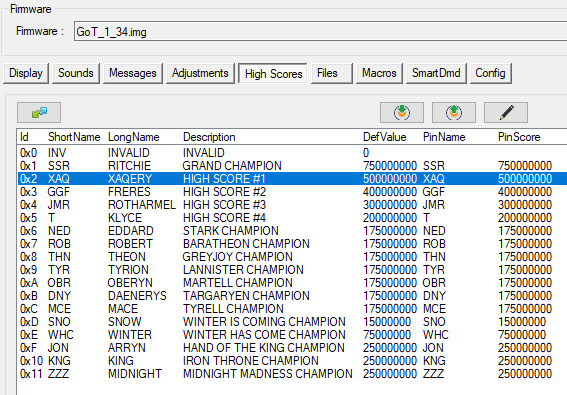 I load X-Men LE 2.4. Load the Macro and run it. It seems that the message was changed fine and the sound was imported into the right location and plays fine, but there is a problem with the picture that was changed. I tried it with 2 different pictures. 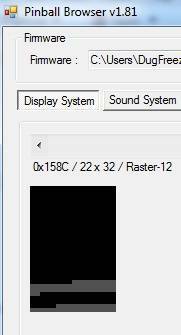 1 time it displayed nothing, but showed a blank Raster-12 where it should have been. The next picture I tried was simply exported and re-imported. 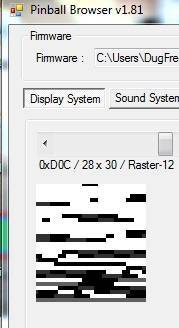 When that was done, it displayed fine as a Raster-12 image, but when being auto imported with a Macro is is garbled looking. I haven't tried browsing to any of the needed macro items. This test was done with everything named and placed in the same position as it was originally in. 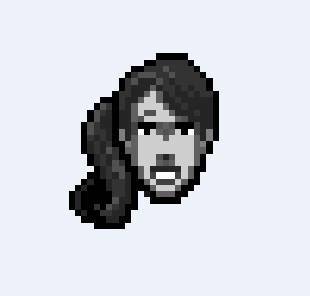 PS: This image was the same as the Wolverine head that I posted on the last post of page 8 of this thread. UPDATE: I tried this with a few bigger DMD images and they import fine using Macros, but I tried on a smaller AC/DC image and it also imported with the Macro feature as being garbled (it's originally a lightning bolt). I don't own a stern machine... but having played Avengers... someone needs to hack that POS and put some movie voice acting in it. That machine was a huge disappointed when I played it. I think it's because there is a message definition after the image definition in the macro. I'll fix it in next release; in the meantime, moving all the message definitions at the begining of the macro will solve this issue (it would be great if you can confirm this !). Holy crap how did I miss this thread? This is some excellent work! This only works for Stern SAM games? I would be willing to bet that Stern Whitestar games (pre Pirates) have a very similar if not the same data structures. So obviously you must rip the ROMs yourself until Stern comes out with their new system. How are the images compressed? Is the algorithm documented? I'm assuming raster-12 is a 12-bit bitmap format? It only works with SAM boards. The formats are not documented and proprietary (sounds, images, ...). Raster-12 is a 4-bit color bitmap + alpha channel. '12' is just the internal type id. When the 'Show transparency' checkbox is checked, transparent pixels are displayed in yellow. This is an amazing program, I too want to express my thanks for this great work, I can now put in other TRON / daft punk tracks that Stern cheaped out on and replaced with custom jingles I've always hated. Just wish there was a solution for extending sound duration for music tracks, do you think there will ever a be a chance to change that, it's not as simple as changing a play length parameter I take it somewhere in the code, as is this is already a god send, this feature would be my utopia. I still have the bug (even when exporting and re-importing with the latest version). I first tried your suggestion with version 1.81 (message change at top). That didn't work. Then I tried it with 1.83 and it still ended up being a garbled image. Here's a pic of my Macro and the garbled pic. If we can extract everything else can we extract the code it self? Or at least change the code itself? I mean I understand it's probably compiled code but can de-compile it and fiddle with it? So who is going to b the first to do a total retheme and is there anything holding anyone back...........This software seems to address everything needed. 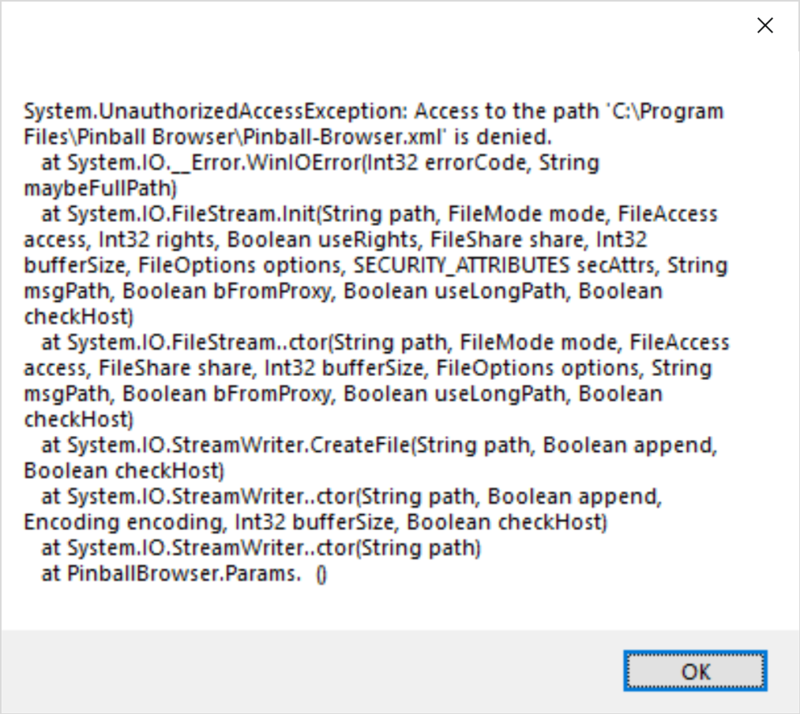 oga83, the macro feature bug doesn't seem to have anything to do with a message or sound file also being imported by the macro file. I have attempted to do a very simple macro file on AC/DC. All I did was went to image 0x695 and exported the image. Then I re-imported the image. It displayed fine. Then I go into the Macros tab and save the macro. 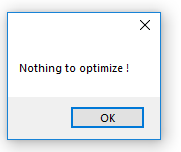 Then I close the program. 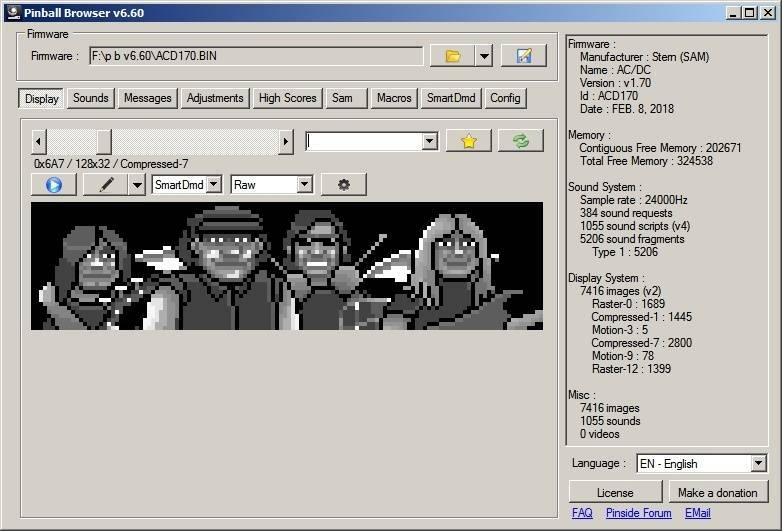 I start Pinball Browser back up and open the AC/DC software and then click the macros tab. I load the macro I saved and click run. It seems to apply fine. But then when I go to the display system and browse to location 0x695...the image is skewed. Strangely...if you do the exact same steps....except you first browse to location 0x695 on the display system and THEN you run the macro....it will re-import and display fine. v1.84 can be uploaded ! I've never player Sterns World Poker Tour, but it seems to get some love. At the same time a lot of people think the theme and art were a bit lacking. Seems like that would be a good candidate fro a re-theme. Does the pinball_broswer utility work with Stern games from that era? So it seems all of the technical hurdles are out of the way to replace "lost" mutants in Xavier mode. 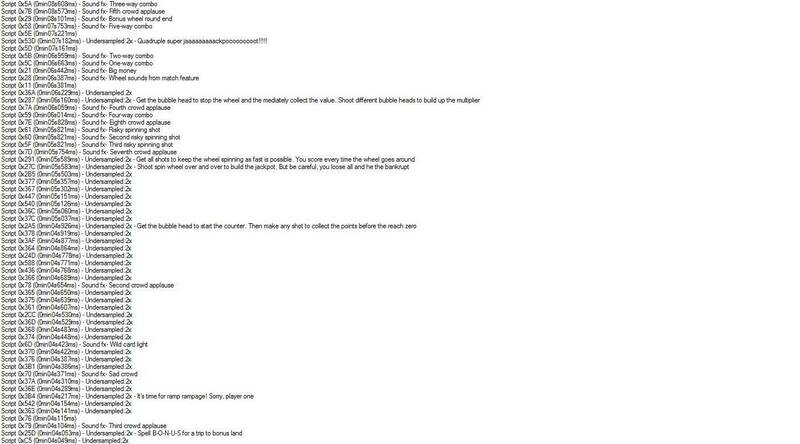 Here is a run down of how to replace Wolverine with Shadowcat. This should work on a Pro (1.05) or LE (1.24) as both the Wolverine image and his name for Xavier mode are in the same location on both. Download the Kitty.png image on this post. 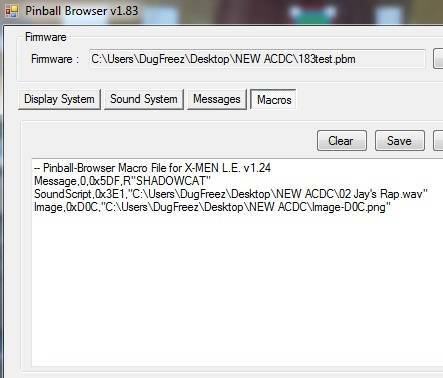 Then start Pinball Browser and click "Open" and browse to the X-Men software. Then click the "Run" button. You will get a Confirm box...click "Yes". Then a window will open that is wanting you to browse to the kitty.png file you downloaded. Browse to it and double click. Then click the "Save as" button and it will ask where you want to save your newly modded software. I would give it a name different than stock so you can easily see it is a modded software. 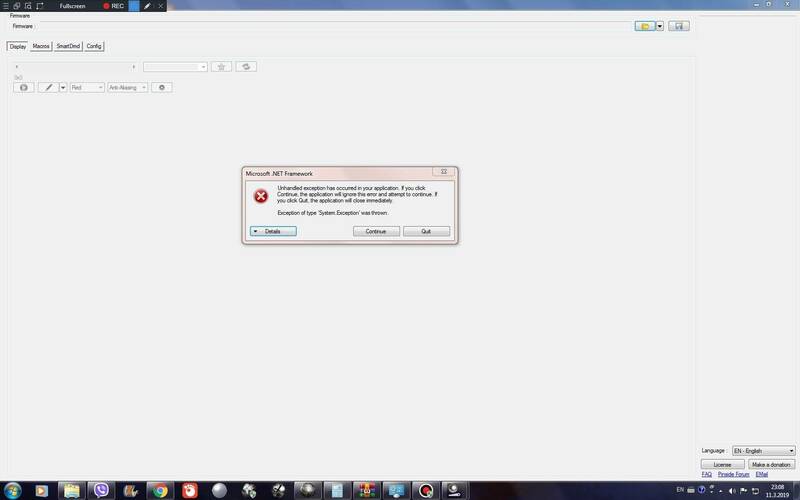 The software is ready to flash. Happy hunting. Nice work Dug, I hear shadowcat will make her debut in the next version as a ball save animation! 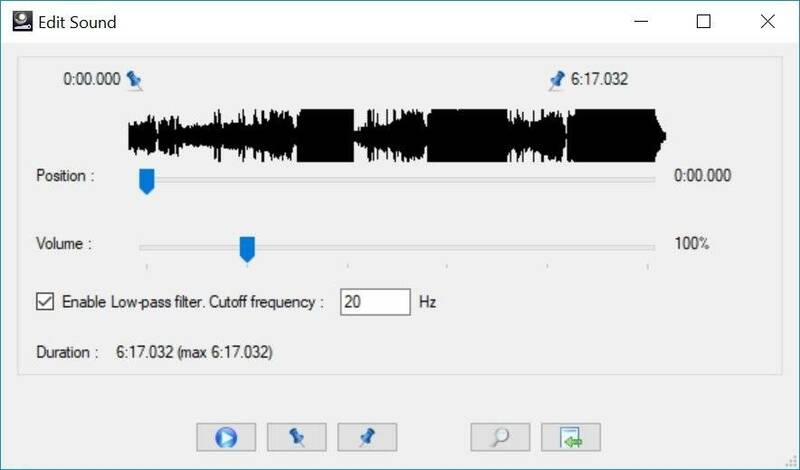 For 2.0, how about the ability to replace audio clips with shorter/longer audio clips instead of them having to be the same size (or have silence/cut off). I had always assumed Stern's downloads were delta updates, but evidently they are full ROM images. Downloaded and messed with a few games, it's an interesting program. What format are the sounds in, OKI/IMA ADPCM or something less archaic? 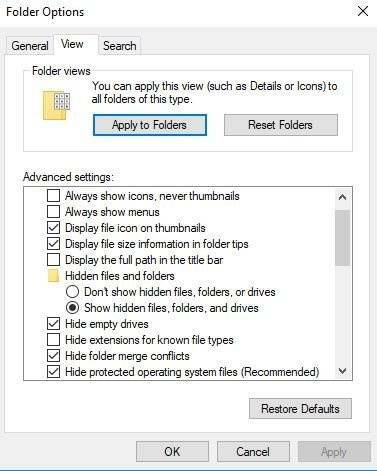 Here's a small suggestion for future versions. Anyway to get in the code info screen? I mean when you power the game up is says the game name and code revision...anyway to change that so you can modify it? Either to personalize it or just add something to show it's a modified code. Tranparency on animations has been hard to figure out. But I think this has been solved in v1.87 ! Many thanks to Dug for all the tests he did. What format are the sounds in, OKI/IMA ADPCM or something less archaic? - Type1 sounds are Adpcm encoded. For those who are not familiar with it, it is a sound compressing algorithm that is mainly used in telephony. The compression ratio is a fixed 1:4 (a 16-bit WAV sample is compressed to a 4-bit sample). - Type2 sounds are compressed with a custom Adpcm-based algorithm. The compression ratio is 1:8 (fixed) ! Great job on 1.87. Not only does it look to be the best image quality since you added the transparencies, but it also seems to refresh the images much better, if you are holding the left scroll button and browsing them in reverse, than any previous version. In 1.87 it doesn't seem to matter if you are scrolling or sliding forward or backward....when you stop on an image it is rock solid. In the earlier versions it could get pretty messy looking if you were just randomly sliding. Of course you could usually correct this by clicking back a few frames and than click forward to the frame you wanted, but as I said, the images on 1.87 look rock solid. I put a picture together to show the progress in 24 hours. Have you approached Stern for a job? I think they could really use your help. I just thought of another suggestion (or 2). If you hold the right scroll button it scrolls through the images and that does a pretty good job of simulating the animations from the game playing. It seems most do scroll a bit faster than they play in the game I have noticed. This is great just to get a look at them, but would it be possible to add an option to throttle the speed of the scroll button to match the games animation speeds more closely? The thing is, I don't know if this varies much from game to game, one version of Pinball Browser to another or even image type or not. After looking through X-Men, Spider-Man and AC/DC it does appear that the custom drawn dot images "play" a bit faster than the live action clips (like the AC/DC concert sequence), but that may just be my imagination. Also....how about a "play" button to auto scroll through the images...and even the sounds for that matter. As a matter of fact, there is a lot more clicking needed to listen through the sounds than it is to just click and hold to get through the images. it also seems to refresh the images much better, if you are holding the left scroll button and browsing them in reverse, than any previous version. This is correct as I redraw all the motion frames starting from the keyframe. Have you approached Stern for a job? I think they could really use your help. Is WPC support something you would consider in the future? Or is their system too proprietary or locked down to make it a viable option? I've never seen this game. I suppose it is a quite different firmware, and it would be too difficult to support it without owning one.